Pink is the color du jour. When I started this page, the pink was PINK as in Pepto Bismallish. I added the lady’s and then ‘knocked down’ the whole thing with some white. I was not at all sure what I wanted to do in the way of ‘hair’ for these women friends, so I decided to go pink with that too, and added some flowers for hair. I did my private journaling underneath and covered most of it, adding the ‘Think Pink’ to remind me of what is written underneath. So beautiful! I let you know that there is another award waiting for you at my blog. so beautiful, Pam…your journal pages are just amazing, girl !!!! They are gorgeous your faces! Pink, I love the color pink and you did a super job with it. It really is too nice to be a journal page. Hope some day to be able to create as wonderful as you do! Your pink is wonderful. Mine is in progress and I’m not liking pink. I would have never dreamed that. I love pink. 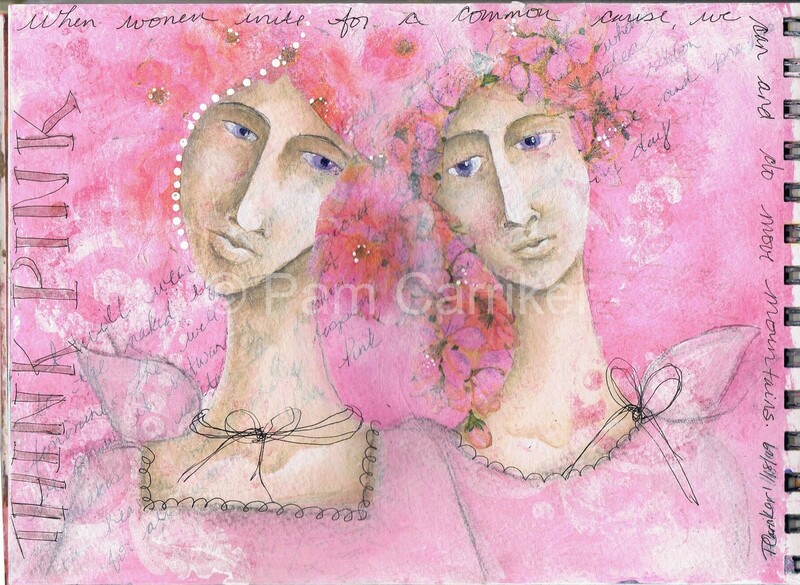 you did a lovely job with the pink Pam, it is almost too nice to be a journal page, lol!